In Spain, cutting ‘jamon’ is a fully-fledged job that brings prestige and money, a man’s world which women are only just starting to take on. 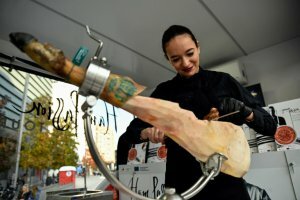 High-level cutters of the country’s world-famous dry-cured ham legs, which can fetch 3,000 euros in markets like China, are employed by top restaurants, at weddings or glitzy events. But women are still a rarity among these ‘rock stars’ of the ham sector. Puri Garabaya, 31, was the first so-called cortadora (cutter) to take part in the recent final of the Spanish Championships for Jamon Cutters in southern Jabugo. For this select group, cutting ham is an art, the slices so thin they’re near transparent, among other techniques. ‘For a cortador to become a master, he must be capable of transforming the cutting process into sensations, into harmony and emotions,’ says Florencio Sanchidrian. A well-known cortador, Sanchidrian has cut jamon for the likes of actors Robert de Niro and Al Pacino, Pope John Paul II, the Spanish king and former US president Barack Obama. He has earned 3,500 euros for just one cutting session, ‘sometimes more’. ‘We’re a little like rock stars, each of us has their own reputation,’ jokes Raquel Acosta, another cortadora – the ‘a’ at the end indicating the feminine classification of the noun as opposed to cortador for a man. Aged 27, Acosta is a pioneer in this very masculine world along with Garabaya. She started off in a jamon store in the western city of Salamanca. At the time though, ‘I didn’t know of any woman who had taken part in a competition,’ she says. Now though, she has travelled to Berlin, Paris, Marseille and London to promote Iberian ham, an opportunity that would have been ‘unimaginable’ before. Still, she says there are very few women who work at that level, between five and 10. ‘Women were forced to work harder to enter this world,’ acknowledges Manuel Pradas, an advisor to cortadores in Barcelona and an expert on the sector. He says ham was ‘long cut in a rudimentary manner’, a reflection of the Spain of the past that was ‘more chauvinistic’. But at the turn of the century emerged ‘a new image of the cortador who has studied all the different cutting techniques’ and focuses more on presentation in a bid to give the job more prestige, he adds. This new image has allowed women – who say they cut ham with more ‘finesse’ than their male counterparts – to enter the ham cutters’ world. Social media also contributed to bettering the visibility of cortadoras, according to Miriam Lopez, founder of the specialised blog Jamon Lovers. With 11,000 followers on her Instagram account, Raquel Acosta is ‘the most famous’, says Lopez. ‘Raquel is an example,’ agrees Luz Maria Zamorano, 35, who in her three years as a cortadora has cut some 2,000 ham legs. ‘It’s a masculine world but I believed that you could bring a feminine touch,’ she says. And at a time when women’s rights are more than ever on the agenda, jamon producers, hotels and television channels are banking on this. Pradas himself manages in Barcelona a team of 25 cortadores that includes seven women who bring ‘freshness’ to the group, he says.